Have you seen this screenshot from an old episode of Bill Nye the Science Guy? It shows Nye with the caption, “Gender is determined by your chromosomes.” Alt-right social media users have been posting it because Nye recently said that gender is on a spectrum. But the old image is completely fake. The screenshot has become quite a popular meme on alt-right social media, posted by people like Andrew Klavan, Ian Miles Cheong and a host of anonymous trolls. Milo Yiannopoulos also appears to have posted it to Facebook, but has since deleted it. And, of course, Reddit’s hub for pro-Trump propaganda r/The_Donald has given the fake image over 8,000 upvotes. 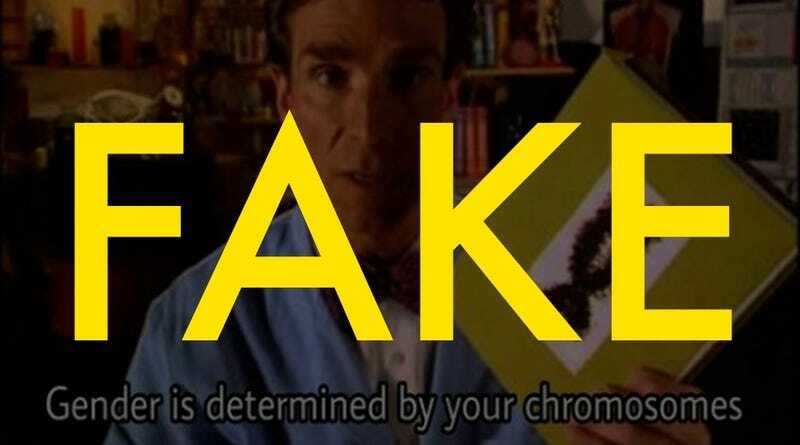 Right wing sites like the ironically named Truth Revolt have also perpetuated the lie, with headlines like “Images Prove Bill Nye Flipflopped on Gender Fluidity.” As though the image itself was proof of something that Bill Nye said, rather than a photoshop-job. I know it’s shocking to hear, but there are a lot of things on the internet that are totally fake. Anyone can take a screenshot of a famous person and put a quote or caption next to them, even if they never said that particular thing. We see this a lot with quotes from famous people. Our genes are stored in parts of our cells called chromosomes. They look like this. Chromosomes contain all of the genetic information, all of the instructions you need to make a person. Now humans have 23 pairs of chromosomes for a total of 46. It’s like the instruction are stored in 46 books. You can watch the entire episode on YouTube, if you’re so inclined, or I’ve trimmed it down to just the part in question and uploaded it here. But just remember that people can make up fake screenshots pretty easily. If you have to share a very real screenshot of Bill Nye laying down some amazing science facts, share the image below. I assure you it’s one hundred percent real. 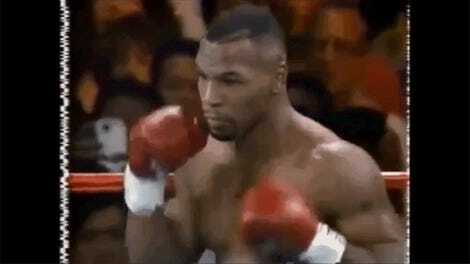 Is This a Time Traveler at a Mike Tyson Fight in 1995?